The David and Bathsheba story is well known from the Old Testament. Noted Norwegian composer Stale Kleiberg has taken the essence of their meeting and life together and blended his gorgeous music to an English libretto smartly crafted by Jessica Gordon. The soloists are group of accomplished opera singers: Ann Einarsson (Bathsheba); Johannes Wiesser (David), Nils Harald Sodal (Joab), Frederik Akselberg (Uriah), and Lars Johannson Brissman (Nathan). Most importantly the singers and the chorus have outstanding diction making the enclosed libretto superfluous. Tonu Kaljuste provides expert direction for the forces of the Trondheim Symphony Orchestra. 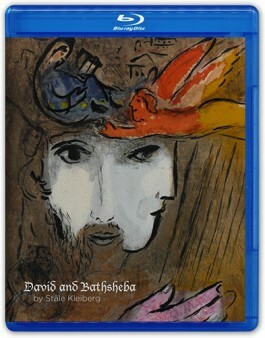 The gorgeous score for this work is illuminated in three high resolution BD versions. These are derived from a 352.8kHz/24-bit master and are available in 5.1 DTS-HD Master Audio or 2-channel LPCM at 192kHz/24-bit or 7.1 DTS-HD Master Audio version with 96kHz/24-bit resolution. The surround versions engulf the listener with a discrete “stage” mix while the 2-channel alternative puts everything up front. I found all to be enjoyable. Downloads in FLAC (96/24), WAV, or MP3 formats are available as well. The acoustic of the Frikirken in Trondheim is reverberant, but does not smear the details of the players or singers. Much of today’s classical music is hard for typical listeners to access due to difficulties with tonalities, rhythms or structure. Fortunately David and Bathsheba has none of these liabilities. It is a beautiful score from beginning to end and there is an ethereal quality that envelops and exhilarates your ears. This opera-oratorio is good enough to gain traction in today’s performance halls and I hope that it does so that larger audiences can enjoy it. The recording does perfect justice and allows the felicities of this composition to get directly to listeners. Highly recommended.